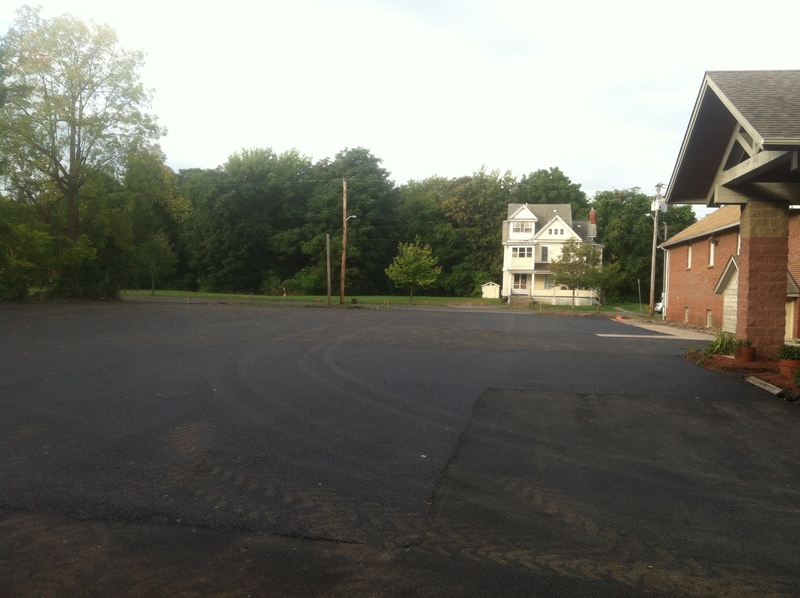 With funding under Onondaga County’s award-winning Save the Rain program, Crest Acura’s porous asphalt lot was completed this summer. 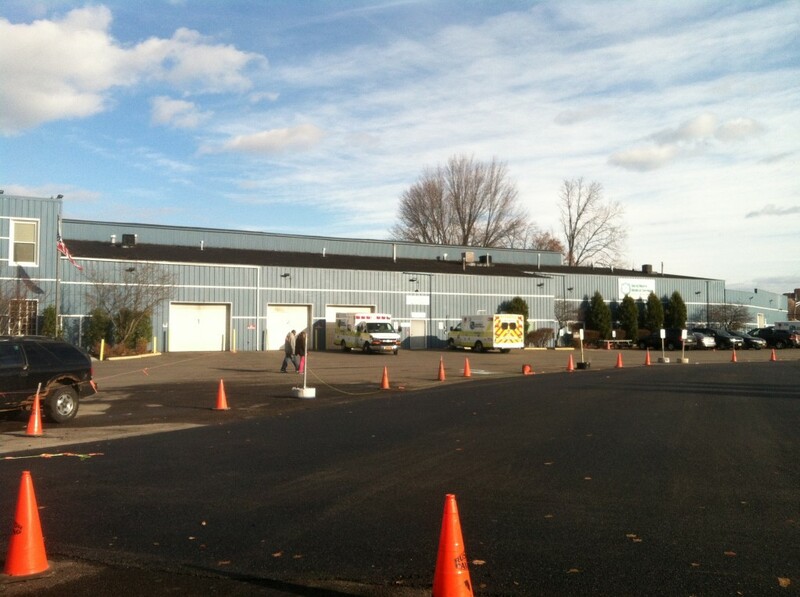 The project was designed by Natural Systems Engineering and constructed by Lan-Co Construction (East Syracuse, New York). The porous asphalt was designed to capture runoff from the 10,000 sq ft porous surface and the 9950 sq ft impervious asphalt lot located to the northeast. 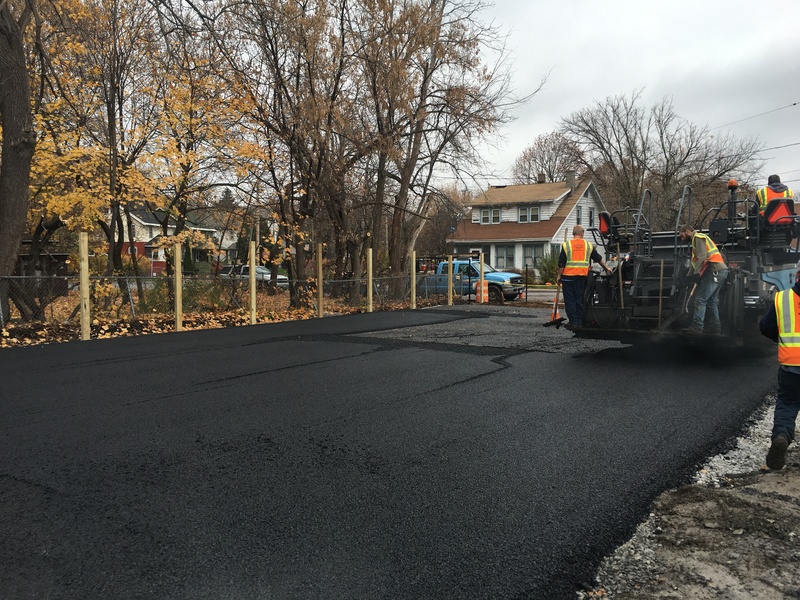 Roughly 1000 sq ft of greenspace was added to replace asphalt in the right-of-way of the City of Syracuse. The project will manage a minimum of 400,000 gal of strormwater per year, removing that flow from Syracuse’s combined sewer system. This entry was posted in Green Infrastructure, Porous pavement, Stormwater Management, Uncategorized and tagged Added greenspace, Central New York, Combined sewer overflows, engineering, green infrastructure, green stormwater infrastructure, infiltration, New York, Onondaga County, permeable pavement, Porous Asphalt, porous pavement, Save the Rain, stormwater, Syracuse on August 4, 2017 by admin. Natural Systems Engineering’s Principal, Kyle Thomas, was quoted for this Newsday (New York) newspaper article on green stormwater management. 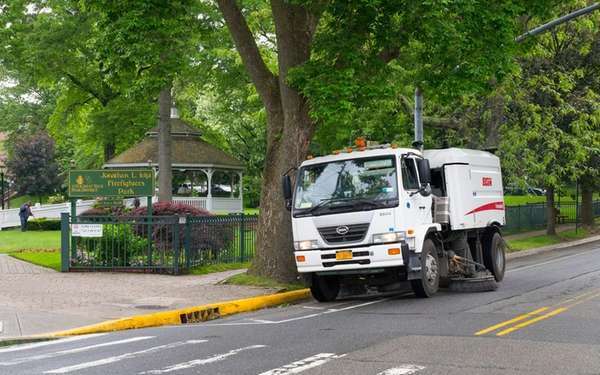 The story describes how the Nassau County municipalities of North Hempstead, Great Neck Plaza and Floral Park have released their 2017 Stormwater Management Reports calling for the management of stormwater water in an eco-friendly manner. Thomas was interviewed to provide a somewhat technical perspective on what management of stormwater in a green fashion actually means. This entry was posted in Green Infrastructure, Stormwater Management, Watershed Modeling and tagged bioretention, bioswale, green infrastructure, Green roof, green stormwater infrastructure, infiltration, New York, Porous Asphalt, porous pavement, porous pavers, rain garden, stormwater, stormwater planter, vegetated roof on May 25, 2017 by admin. Final 2016 “Save the Rain” Green Infrastructure Project Complete! 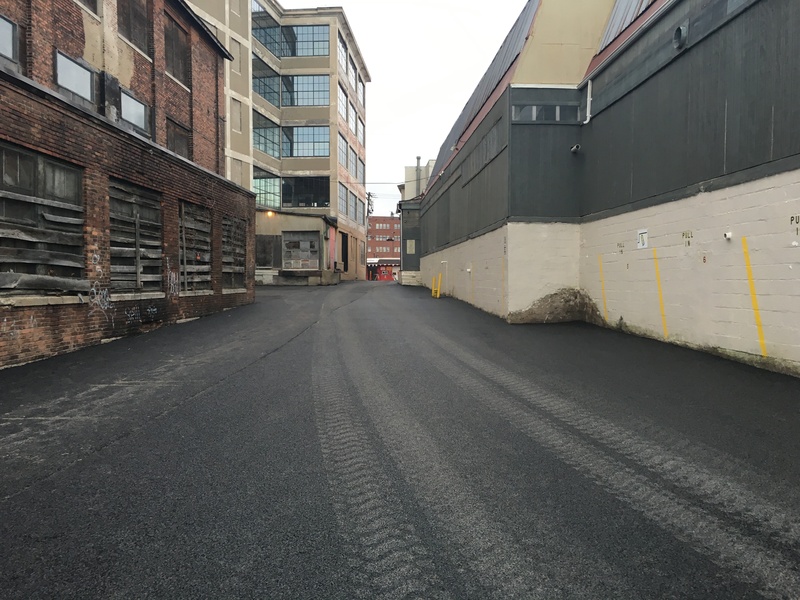 In November 2016, construction was substantially completed for the Gear Factory Porous Asphalt lot serving the northern 200 block of South Geddes Street. 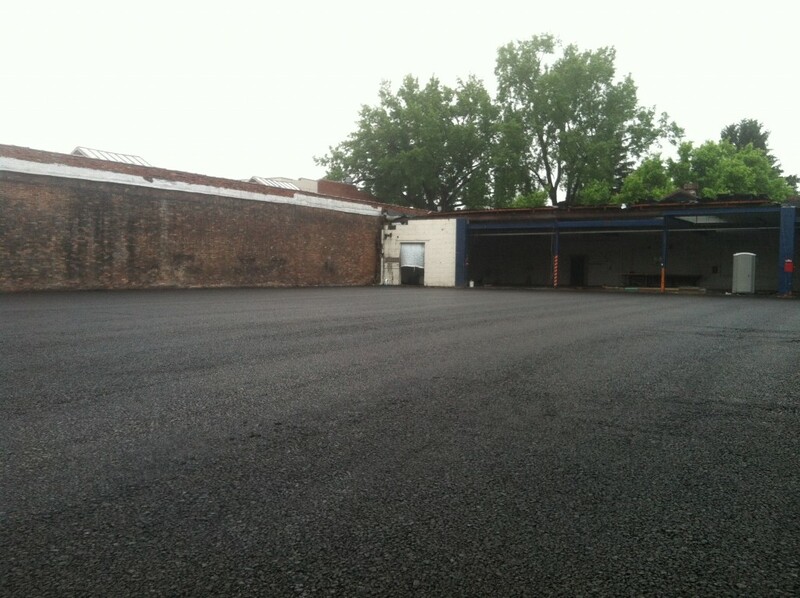 The project involved conversion of impervious alleys and a parking lot associated with the Gear Factory building and the building housing City Hardware into a porous asphalt lot and infiltration basin, which will manage runoff from the 19,000 sq ft of impervious hardscape and almost 15,000 sq ft of rooftop. The project will manage roughly 630,000 gal of runoff annually preventing that volume of runoff from entering the City of Syracuse’s combined sewer system and mitigating combined sewer overflows from that system. This entry was posted in Green Infrastructure, Porous pavement, Stormwater Management and tagged Central New York, Combined sewer overflows, engineering, green infrastructure, green stormwater infrastructure, infiltration, New York, Onondaga County, permeable pavement, Porous Asphalt, porous pavement, Save the Rain, stormwater, Syracuse on November 22, 2016 by admin. Recent Save the Rain Project Featured on Channel 9! The Ra-Lin “Save the Rain” project designed by Natural Systems Engineering was featured on WSYR News Channel 9 on September 30, 2016. 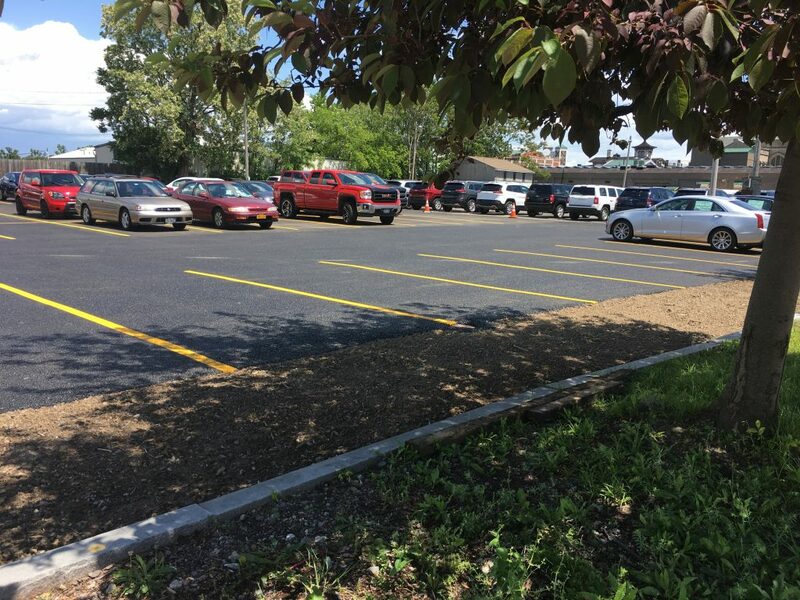 The project involved construction of approximately 16, 000 sq ft of porous asphalt and a bioretention area to manage stormwater runoff from the 1.5 acres of impervious areas at the discount appliance store located on Burnet Avenue in Syracuse. The project will result in the management of over 1.2 million gallons of stormwater annually, preventing that volume from entering the storm sewer system and contributing to combined sewer overflows to Onondaga Lake. The story on Channel 9 shows how the porous asphalt allows infiltration of rainwater through the porous surface. This entry was posted in Green Infrastructure, Porous pavement, Stormwater Management, Uncategorized and tagged Central New York, Combined sewer overflows, engineering, green infrastructure, green stormwater infrastructure, New York, Onondaga County, permeable pavement, Porous Asphalt, porous pavement, Save the Rain, stormwater, Syracuse on October 17, 2016 by admin. Construction of green infrastructure was completed in late 2015 consisting of a dry well to management roof runoff and a porous asphalt system to manage parking lot runoff. Green infrastructure was designed by Natural Systems Engineering and construction was performed by the Rich and Gardner Construction Company (Syracuse, New York). The project was funded by Onondaga County’s award winning Save the Rain program. This entry was posted in Green Infrastructure, Green Roof, Porous pavement, Stormwater Management and tagged Added greenspace, Central New York, engineering, green infrastructure, green stormwater infrastructure, New York, Onondaga County, permeable pavement, Porous Asphalt, porous pavement, Save the Rain, stormwater, Syracuse on January 19, 2016 by admin. Patent Issued – “Retrofit Catch Basin for Use in Stormwater Management Practice”! On September 8, 2015 patent number 9.127,488 was issued by the USPTO for “Retrofit Catch Basin for Use in Stormwater Management Practice.” The device allows a conventional stormwater catch basin to be retrofitted to divert runoff to an alternative practice (such as green infrastructure) while allowing the catch basin to continue to serve as an overflow for the alternative practice. Now looking for a partner with whom to commercialize this! This entry was posted in Green Infrastructure, Stormwater Management, Uncategorized and tagged bioretention, bioswale, Combined sewer overflows, engineering, green infrastructure, green stormwater infrastructure, infiltration, stormwater, stormwater planter, tree box on September 21, 2015 by admin. Birds Eye View of New Green Roof at Zip Networks! 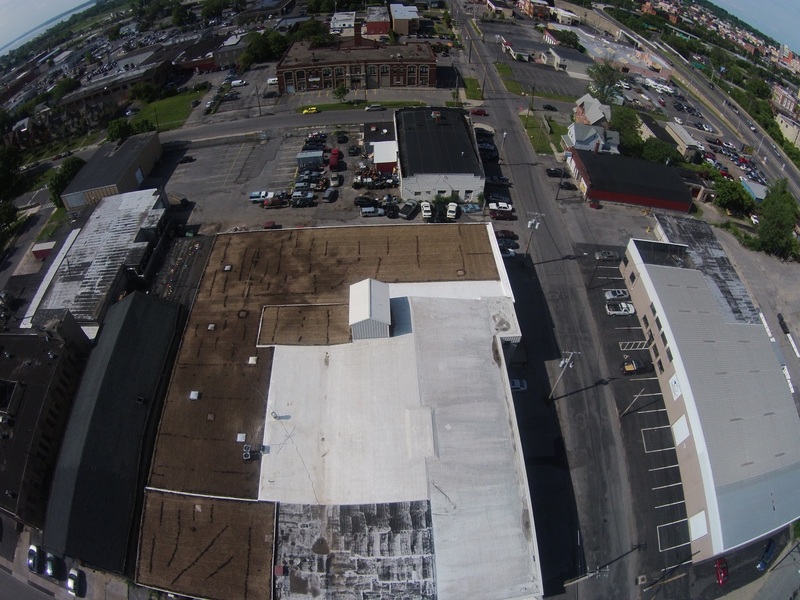 As seen from a passing drone, shown is the new vegetated roof at Zip Networks, 100 Wilkinson Street, Syracuse. The green roof is an extensive green roof planted with sedum. Construction was performed by Shaffer Building Services (Syracuse, New York) based on the design of Natural Systems Engineering. The roof looks brown due to the erosion control mat, but will be green by the end of the season! The project was funded by Onondaga County’s award-winning Save the Rain program. Birds Eye View of Zip Networks Vegetated Roof. This entry was posted in Green Infrastructure, Green Roof, Stormwater Management, Uncategorized and tagged Central New York, Combined sewer overflows, engineering, green infrastructure, Green roof, green stormwater infrastructure, New York, Onondaga County, Save the Rain, Syracuse, vegetated roof on June 9, 2015 by admin. First 2015 Save the Rain Project Nearing Completion! Work is almost complete on the porous asphalt lot at Crest Acura. 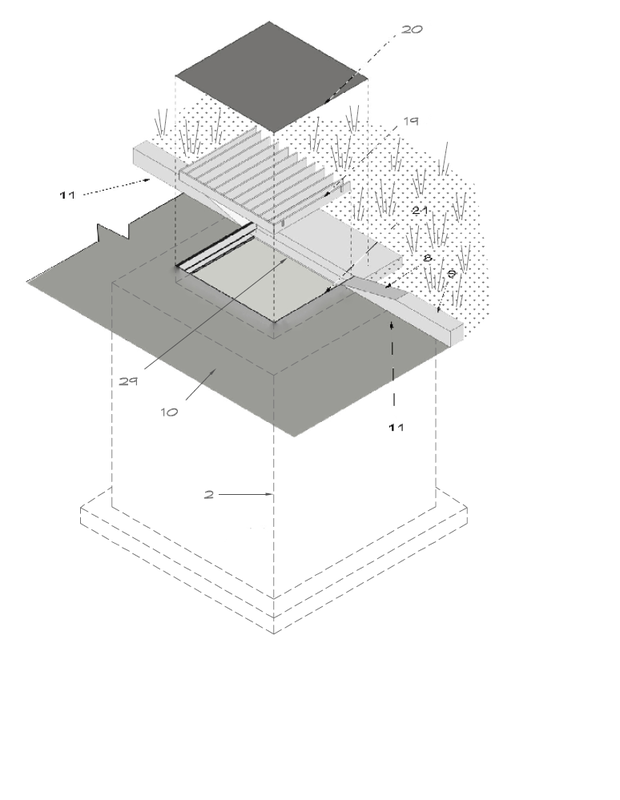 The permeable base is shown below. The project was designed by Natural Systems Engineering and construction is being performed by Rich & Gardner Construction Company (Syracuse, New York). In addition to managing incident precipitation to the ~15,000 sq ft lot, the project will also infiltrate runoff from the adjoining Crest Acura showroom and service areas. A total of 1.5 million gallons of stormwater will be managed annually. On June 1-2, 2015, following placement of the permeable base course shown below, NSE measured the site-wide infiltration rate through the roof sump/overflow catch basin. Following the June 1 rain event, the site exhibited an infiltration rate of 0.35 in/hr. Based on this rate, the infiltration basin will completely dewater in roughly 10 hours assuming no additional rainwater input. This entry was posted in Green Infrastructure, Porous pavement, Stormwater Management and tagged Central New York, Combined sewer overflows, engineering, green infrastructure, green stormwater infrastructure, infiltration, infiltration rate, New York, Onondaga County, permeable pavement, Porous Asphalt, porous pavement, Save the Rain, stormwater, Syracuse on June 2, 2015 by admin.